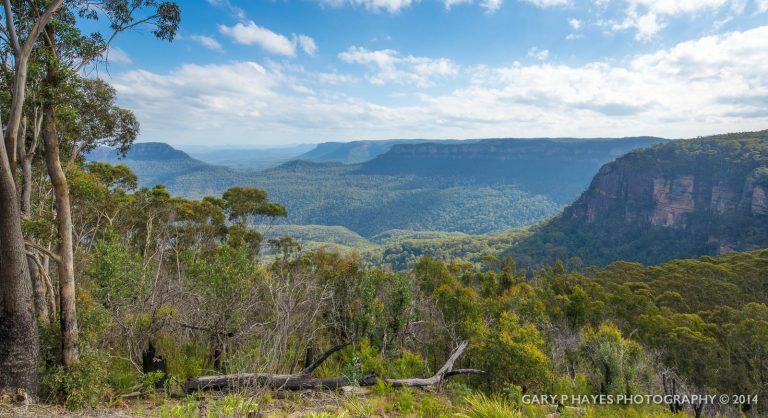 ABOUT: For the ultimate in lazy, antithesis of landscape photography try this view from Panorama Drive, just around the corner from Echo Point. You can literally take this from your car window if you park at the right spot. Seriously though on very bad weather days it offers some comfort if you are looking for panoramic lightning storm or heavy winter mist type shots. PHOTO EQUIPMENT TO BRING: You can bring your whole kit as you will be seconds from your car or shelter. But consider a stitched panorama using a normal lens and/or zoom into the distant ruined castle and background hills using a 100-400mm range. Tripod position on the pavement so bring one. GETTING TO THE SPOT/S: Park on Panorama Drive which has meters between 9-5pm so consider outside these hours for unlimited lazy location photography!